Recent data indicates many marketers are dissatisfied with content marketing. Content can be one of the most powerful ways to engage with and influence customers. So why are so many marketers failing to see results? This content marketing blog series will try to answer this question. It’s geared toward helping dissatisfied marketers get more out of their content marketing at every stage of their content workflow. This series will also present new ways of thinking about this ever-changing industry that you might not have considered previously. In this post, we start out with content marketing’s hype cycle and seven reasons your content marketing may be ineffective. Our next post will focus on how to make it more effective. Remember the hype around “Big Data” a few years back? What about “Internet of Things” and “Data Science”? According to Gartner, these terms were all over-hyped. Gartner even branded a name for these psychological ups and downs revolving around new technologies—Hype Cycle. It’s our collective sentiment and experiences regarding a new technology that initially reach extremes, but plateau over time. This leveling off tends to coincide with best practices being developed and eventually productivity being realized. Content marketing is moving through its own hype cycle. 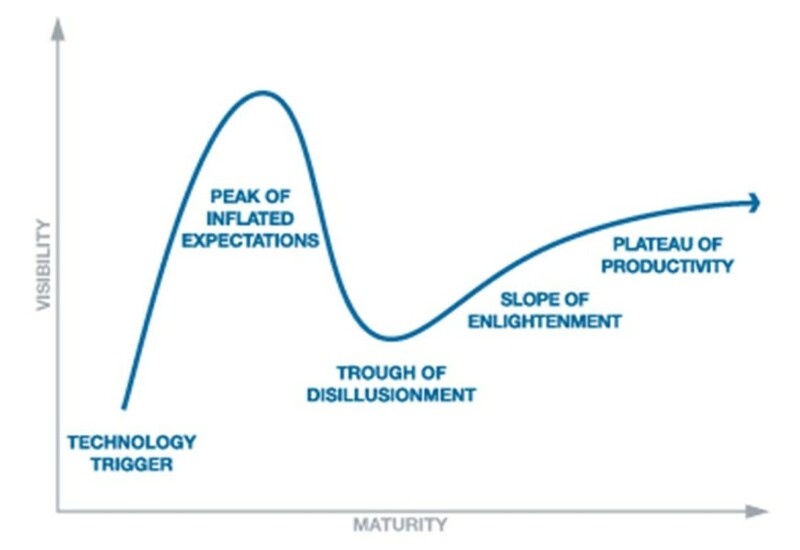 One can argue that content marketing has dropped from the “peak of inflated expectations” to the “trough of disillusionment” for many marketing departments. According to a CMI and MarketingProfs report, 93% of B2B technology marketers use content marketing to attract and retain customers. However, 66% believe they are ineffective. Based on this data, one could conclude content marketing does not work for most. That may be a big reason why content marketing adoption rates have peaked and, according to CMI, are declining. The content marketing industry is at a crossroad. Ineffective content marketers must evolve to compete and succeed. It’s possible that many of these same marketers are using ineffective content marketing strategies and techniques. These could even be strategies and techniques that were effective previously, but due to the constantly changing digital marketing landscape are now deemed ineffective. Applying ineffective strategies and techniques is what I call MalContent Marketing due to poor results and negative sentiment. Such marketing needs to adapt and evolve. I will explain in a moment seven ineffective content marketing techniques that yield poor results and need improving. Alternatively, some content marketers are effective and actually are experiencing positive results. What’s their secret? It varies, but in my next post I will present one path to successful content marketing that I call MegaContent Marketing. This grandiose term crystallizes the multiple actions required to compete and succeed. The term also speaks to the positive sentiment an effective content marketer. I believe a content marketers effectiveness is directly related to two key factors: volume and quality. In general, the more high quality content assets you publish and the more high quality social channels you promote on, the more effective you will be. This is no surprise to most, but the devil is in the details. The remainder of this two part series will provide the details describing how to improve volume and quality throughout the content marketing workflow. 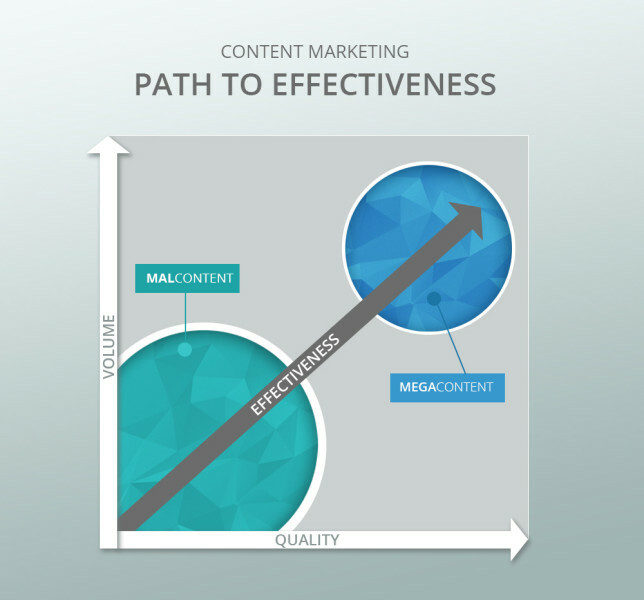 For now the visual below is merely an overall view of content marketing’s path to effectiveness. 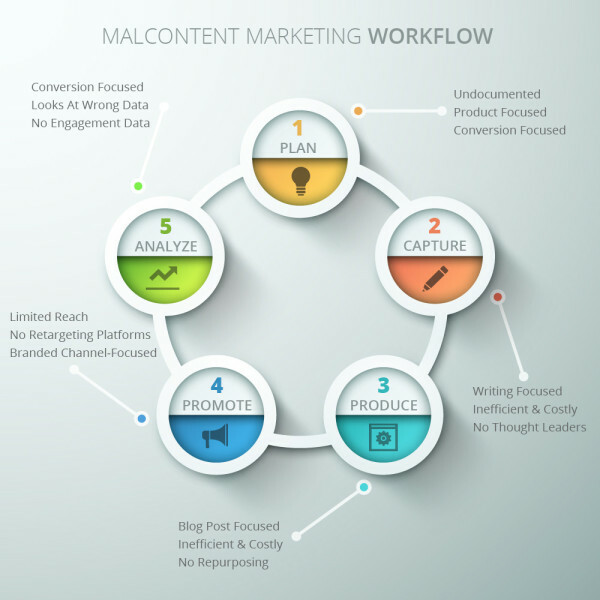 MalContent Marketing has inefficiencies and ineffectiveness at every phase of this workflow. Below are seven reasons why your content marketing is ineffective and thus yielding sentiments of malcontent. 1) Your content strategy is unrealistic. Most content marketing strategies revolve around writing content for someone to read and be inspired enough to visit the website and progress deeper into the sales funnel. If this is your strategy it’s primarily conversion-based. Data suggests this is the greatest myth in content marketing. Content marketing is not a simple linear progression of finding your content, reading your content, and converting to a lead. It is rather an iterative process of finding and reading your high quality content again and again. This builds an awareness and trust in your brand that may lead to an eventual conversion. For example, according to thought leader Rand Fishkin, it takes Moz an average seven and a half visits before someone signs up for a free trial. 2) Your content strategy lacks quality. Many marketers treat content much like an ad, just in longer form. It has become a ploy rather than a craft. Marketers primarily focus on how to write content in order to maximize conversions. In these cases the hero of the story remains the brand. However such content is not being consumed or attracting long lasting engagement. According to thought leader Jeffrey L. Cohen, many marketers fail because they’re just not creating content that connects with customers and prospects in a meaningful way. Another way your content strategy may lack quality is in who is contributing. One can argue the most valuable and engaging content lives in the minds of your brand’s thought leaders, partners, clients, and employees. If your strategy ignores these critical sources it likely lacks quality and definitely lacks efficiency. 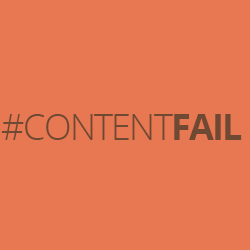 3) Your content capture is inefficient. Before it can be formatted, content ideas and raw thoughts need to be captured somehow and by someone. Typically this responsibility falls on the marketing department’s assigned writing staff. These bloggers think of the topics to write and then proceed to write or ghost write blog posts. But having only your marketing department carry this growing load is inefficient. 4) Your content capture technique is demanding. Marketers must turn to other sources of content like thought leaders, clients, partners, etc. just to keep pace with the growing demand for quality content. However, writing is time consuming and these people are very busy. It can also be intimidating for non-writers and is a relatively inefficient way to transfer knowledge. Yet writing is the primary method for capturing industry knowledge. This is the wrong approach to capturing truly valuable content. Why? Capturing content via writing demands perfection, stifles authenticity and ultimately limits participation to only those who have time to write. This is a main reason company thought leaders remain a relatively untapped marketing resource; they’re too busy to write. If your company is still relying on writing as your primary form of content capture you are missing out on a wealth of other opportunities. 5) Your content production is limited. We all can remember when corporate blogging was in its infancy. Now nearly every B2B company has a blog and an internal team creating the content for that blog. 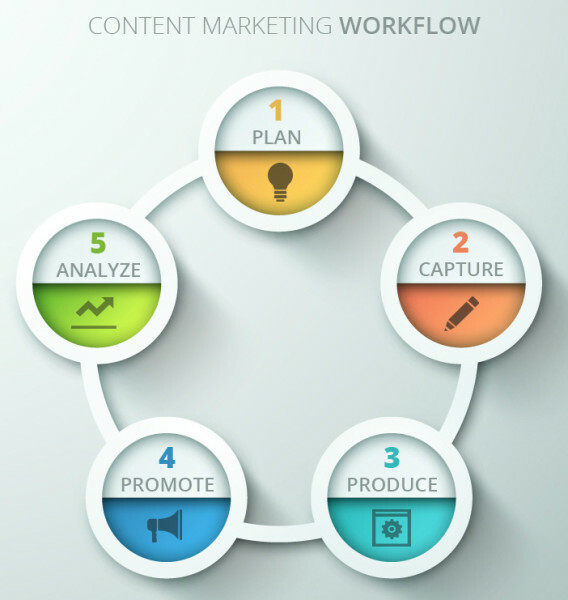 However, content production has evolved and that content production model is quite limited. Considering that more and more of your target audience consume your content via a mobile device, writing blog posts alone is becoming less effective. Your target audience is moving from reading blog posts and towards engaging in videos, podcasts and other multimedia. But even if you jumped into those multimedia production waters, are you repurposing the content and creating cross-media marketing assets? If not, your content production capabilities are being not fully leveraged. 6) Your content promotion is lightweight. Do you think your target audience is clustered on LinkedIn and you don’t need to invest in reaching out on other social channels? Or perhaps your content promotion tactic is to build your followers and reach on only LinkedIn, Twitter, Facebook and G+. It’s certainly a good start, but given the rapid change in digital marketing and social media, this is considered lightweight content promotion as it’s channel-based and silo-shaped. There is so much more to consider and capitalize on when it comes to promoting your content effectively. 7) Your content analysis focuses on the wrong data. Technology has become a critical tool for identifying which content and channel combinations are the most effective. In fact, your company’s CMO now likely spends more on technology than your CTO. Bid management platforms, attribution platforms, engagement testing technologies, SEO management tools, social media management software, and retargeting platforms all need to be considered. They allow you to pull the right insight to deliver content to the right people on the right device at the right time. Given all this, your content analysis may well be looking at the wrong data. Effective content analysis goes well beyond how many people viewed your content and converted into your funnel. Here is a visual representation of the above inefficiencies. I call it MalContent Marketing since it typically results in dissatisfaction. In my next post, I will explain how to fix the above inefficiencies in a new twist on content marketing I call MegaContent Marketing.